Click “Contact” and provide us with the details. Pay a low one-time legal fee of $199-$299. We complete paperwork & file it with the court. We send you notifications of key dates to your secure online client account. A settlement is reached or your case will be heard in front of a judge. 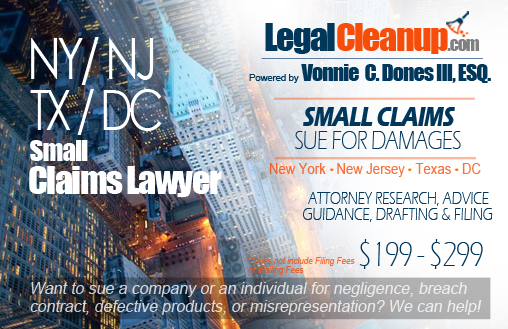 New York, Texas, Washington, D.C. & New Jersey Small Claims Lawyer Offering Traditional & Online Legal Services. $199- $299 for New York and New Jersey, Texas and Washington, D.C.! Having trouble getting your security deposit, receiving compensation for vehicle damages, or obtaining wages or money owed to you? Need help suing a company or an individual for professional negligence, breach of contract, defective products, or misrepresentation? We can help! You receive peace of mind knowing that you have an attorney handling your small claims lawsuit every step of the way. You simply provide us with the details, sign the documents, and show up to court. Research Your Case (court venue, company agents, defendant address). Prepare all the required Small Claims documents. File your Small Claims complaint with the appropriate courthouse. Draft and mail your Demand Letter (certified mail & tracking included). Notify you of your trial date. Additional motion and service support for an additional fee (date reset, subpoena, etc). In New Jersey, the most you can recover in small claims court is $3,000, or $5,000 if you’re demanding the return of a security deposit from your landlord. In New Jersey, the court costs / filing fee starts at $42 for one defendant. If your case is in New Jersey and you are suing for more than $3,000, we have can help you file your lawsuit in the New Jersey Superior Court Special Civil Part. In New York, the most you can recover in small claims court is $5,000. In New York, filing fees range from $15 for claims of $1,000 or less; $20 for claims more than $1,000 to $5,000. In Texas, the most you can recover in small claims court is $10,000. In Texas, filing fees range from $34 to $146, including service fees, in some instances. In DC, the most you can recover in small claims is $10,000. In DC, filing fees range from $5 for claims of $500 or less; $10 for claims more than $500 to $2,500; $45 for claims more than $2,500 to $10,000. Please note that there may be additional copying, mailing, service (DC and Texas only), and notary fees (Texas and DC only) depending on the circumstances of your case. For small claims DC cases, we offer online notary services over webcam completed within minutes and process server deliveries for additional legal and service fees. If you would like for us to schedule a lawyer, although not required and recommended in some cases, to appear and represent you at your small claims hearing, we can do so for an additional fee.